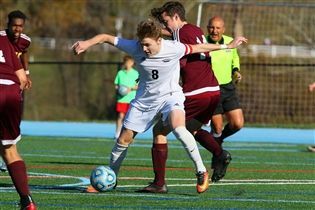 Playing on home turf Monday afternoon, varsity boys’ soccer bested Gloucester Catholic 3-0 to advance to the finals of the NJSIAA South Jersey Non-Public B tournament. 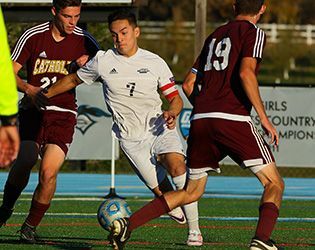 The Knights scored twice in the first half, with a goal from Anes Mrkulic ’17 off an assist from Kevin Brito ’17 followed by a goal from Cam Miller ’17 off an assist from Mrkulic. 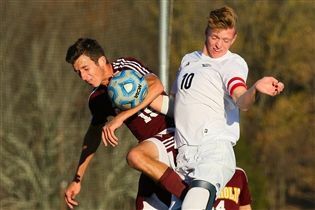 In the second half, Brito scored off an assist from Mrkulic. Keeping the opposition scoreless, Alex Roch ’18 made eight saves for the Knights. Thursday, the boys will face Wildwood Catholic in the finals at Holmdel. The game begins at 7:30 p.m.